Certainly a specialty trailer, but when you need to haul a lot of canoes . . . This canoe trailer is designed to haul 12 boats, with easy loading, unloading and tie-down. The design is strong for long life, and it is stable to pull well — empty or full. Check out all the unique features. If you need to haul canoes, start here. Single Axle, Leaf Spring Design. Choose Axle Capacity of 5400 lb. or 6000 lb. On board storage for PFD’s and paddles. Plans for this Single Axle Canoe / Kayak Trailer come by special request. The trailer will carry up to 12 canoes or kayaks — boat length up to 18 feet long. Plans include optional storage space to carry paddles, PFD’s and other things for the trip. These are Do-it-yourself plans so you can build it to meet your specific needs. For an awesome canoe or kayak hauling trailer, start with these plans! Like all our trailers, this one is designed for Strength, on road Stability, and great Functionality. For Strength and simplicity, the trailer uses standard steel beams with triangulation for rigidity. It is strong, by design, starting at the frame. Towing Stability is natural by adhering to design fundamentals, and proper construction. 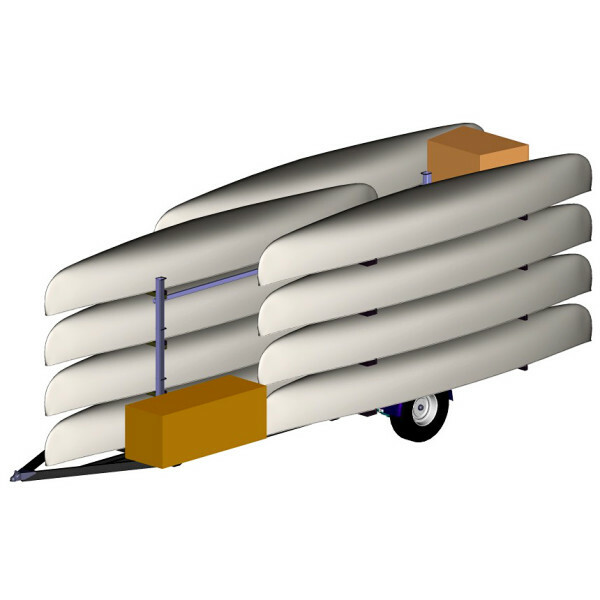 The canoe trailer plans have the right design, with easy to follow instructions. By Design, Functionality is part of the plan. It will carry a full load of boats, yet be easy to use. The 4-up canoes use space effectively so the top canoes are not too high. The trailer is long enough to carry 12 canoes but is as short as practical for maneuverability. For Equipment Storage, there are 2 optional cabinets. See the pictures. One opens from the top, the other (at the back) opens with a door. These give easy to access equipment even when canoes are on. Storage boxes fit standard size equipment, but there is space to modify them a little to meet other size requirements. Add a latch for security and a tarp for cover, and the trailer serves as an off season storage rack too. These canoe trailer plans are complete. They include options for customization, a full list of materials, suggested parts and sources, complete illustrated instructions, full detailed drawings, and more. Read about What is in the Plans . . .
Dimensions will vary slightly with equipment choices and construction options. Trailer will carry a maximum of 12 canoes or kayaks, each up to 18 ft length. Boats secure to the racks via straps to tie-down loops welded on the frame. Your choice of straps (rope, bungees, tie-downs, etc.) will effect the security of the boats during transit. Please secure the boats carefully. Several options in the plans provide a variety of functions. Some options are mutually exclusive. Not all options are in the pictures here. Trailer weight depends on the options chosen, however, if done complete, empty trailer weight is approximately 1500 lbs. A loaded trailer will be much more. Please be sure your tow vehicle can handle these loads. For more plans info, read about what the plans contain, and why our trailer plans are better. Construction requires metal working skills like cutting, drilling, set-up and welding. Max Load Capacity depends on the axle option chosen (4000 or 6000 lbs), and must include the trailer weight. If you would like to build this trailer, order the plans and download them today. Just follow the links above. The plans are in PDF form and include complete, easy to follow, fully illustrated instructions and blueprints. In addition, excellent plans for other helpful tools like a our Mobile Gantry Crane are available. * Trailer load capacity is dependent on axle(s), components and material options. 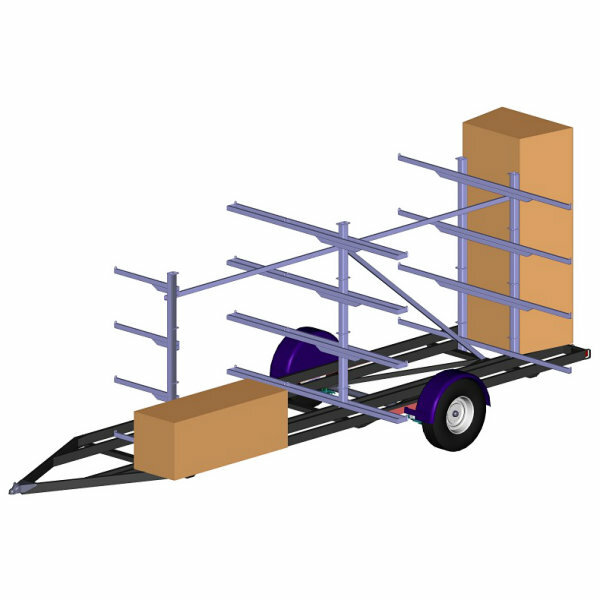 It also depends on materials, construction techniques, assembly methods and proper load application — and includes the weight of the trailer. Load capacity given does not include capacities for purchased parts such as the hitch, safety chain, springs, axles, tires, etc.. Do Not Exceed Manufactures Limits. Always use caution, proper safety equipment and tie downs when loading and towing a trailer.